A good movie. Not a perfect one, but recommendable. 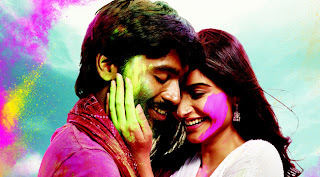 That is the briefest review I provide if you ask about Raanjhanaa (Ambikapathy in Tamil). The frontiers of different cine'woods' in India are melting down and this movie is a result of that. Raanjhanaa is obviously a Dhanush movie. Because of his soulful performance, Kundan lives on the silver-screen and in the hearts of a million moviegoers. Raanjhanaa is a romantic movie with some differences. It is special in its plot, setting, cast, music, cinematography and an invisibly visible emotional flow. For Dhanush, the character is not at all challenging. Because he has embodied the same in many of his previous Tamil works. And of course, for Sonam too the character is somewhat similar to the one she played in Mausam. All the other co-actors, including Abhay Deol, have enacted their respective roles perfectly. A. R Rahman's soothing music flows through the entire movie like the holy river. Since Raanjhanaa is not a repeatedly repeated stuff, the director has a point in making this love story. The script is convincing to a great extend. But the politics thing is just half-baked. The climax part makes it stand out of the hereditary box of Indian filmy romance.